Bubenreuth Bubenreuth is located in the heart of the cultural landscape of Northern Bavaria and Franconia, in the southern parts of the natural retreat area Franconian Switzerland. The region was “discovered” by German Romantic artists such as Ludwig Tieck and is celebrated as one of the most beautiful regions in Germany. Characteristic of this region are not only beautifully natural landscapes, but also castles, architectural heritage and parks (e.g., the rock garden Sanspareil designed for the sister of Frederick the Great of Prussia). Other aspects typical of this region are of course its unique culinary mannerisms and the very exclusive Franconian way of life or “savoir vivre” which includes the traditional cuisine, the flattened wine bottles called “Bocksbeutel” and last, but not least, the world‘s highest density of breweries. Surrounding Bubenreuth you will find several interesting tourist attractions including four of Germany‘s 38 UNESCO World Heritage sites. The Margravial Opera House in Bayreuth has been a part of the UNESCO World Cultural Heritage since 2012. Furthermore, Bayreuth is home of the Richard Wagner Weiterhin ist es Veranstaltungsort der Richard Wagner Festival and you can visit Wagner`s Villa – the House Wahnfried – along with a museum in the park. (Currently, the Richard Wagner Museum is undergoing an impressive renovation and remodeling). Bamberg`s Baroque old city center with its medieval road infrastructure, has been on the UNESCO World Heritage list since 1993. The medieval old city center of Regensburg, of Regensburg, with its typical towers and the baroque district Stadtamhof, belongs to the UNESCO World Cultural Heritage since 2006. Würzburg`s majestic Residence Palace was registered as a UNESCO World Cultural Heritage Site in 1981. 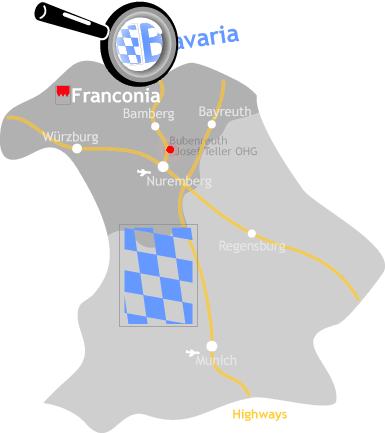 Nuremberg — Bavaria`s second largest city, metropolregion and home to the Bundesliga team the Club — is also considered a very attractive tourist location. Despite the fact that the city had been severely destroyed during WWII, there are still many medieval buildings and artworks that are worth a visit. If you want to get a deeper understanding of the History of Nazi Germany the Documentation Centre Nazi Party Rallying Grounds on the vast former deployment and presentation site is a must-see. Thanks to the many maps, info boards and audioguides set up by the cultural department of Nuremberg, there is plenty of information to receive. Another very interesting location is the Memorium Nürnberger Prozesse Prozesse which deals with the question of how Germans in the early years of the Federal Republic of Germany managed to process their Nazi-past and how the victorious powers (The Allies) dealt with the propagandists of those times. Today, Nuremberg`s most popular event might actually be the Christkindlesmarkt the local Christmas Market which takes place every year in December. Additionally, Nuremberg’s museums are really worth seeing. The Toy Museum is really amazing. The Germanische Nationalmuseum is, according to their own statement, Germany's largest museum of cultural history . It not only exhibits its world famous paintings by Albrecht Dürer, but also its extraordinary collection of instruments. the Neues Museum for Modern and Contemporary Art and Design and in the Kunsthalle Nürnberg. The German art of wood carving is still alive in its greatest masterpieces at their original place of exhibition in Nuremberg; e.g., the “Englische Gruß” by Veit Stoss in the Sebaldus-Church. But you will also find it in Rothenburg ob der Tauber (which is 135 km away from Bubenreuth and considers itself to be the “Romantic city“ of Germany) with its Late Gothic “Heilig-Blut-Altar” by Tilman Riemenschneider in The Church of St. Jacob. After WWII many protagonists of the Bohemian music industry settled here in Bubenreuth. As a consequence of a courageous decision made by the mayor of those days, the population of the little village, with only a few hundred inhabitants, suddenly grew into thousands. Many famous musicians, from Menuhin to the Beatles and Elvis, played instruments made in the workshops of Bubenreuth. Bubenreuth’s own museum, Bubenreutheum exhibits the history of instrument making in Bubenreuth. 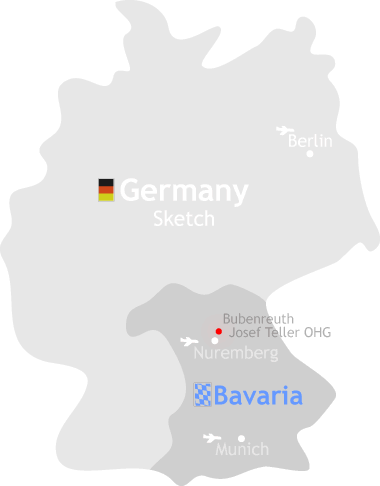 If you need more detailed information about how to find our workshop, or if you would like to receive more information regarding a visit to Bubenreuth, please don't hesitate to contact us.